Someone at Essex Uni produced this map, which indexes how similar dialects were to that of London in the Survey of English Dialects. Notice how the east coast has a band of Londonisation running up. Times have changed since then. I've understood "Estuary English" to denote a common non-RP accent in most counties of the south-east. For example, I can't imagine that there is any trace of traditional speech left in Sussex but that doesn't mean that everyone there speaks RP. Instead there is a variety more similar to Cockney than to traditional Sussex that is effectively their local accent. Does this sound right? Accents of English deals only briefly with the south-east outside London (e.g. Kent, Surrey, Sussex, Berkshire). Was this because their local accents were on the brink of extinction at the time and you weren't sure what would happen in their place? @Ed: That map is by Hans Goebl from the university of Salzburg, and is from The Computer Developed Linguistic Atlas of England. It doesn't represent similarity to the Cockney accent; it represents similarity in terms of the answers (lexical, morphological) to the SED questionnaire, and since the Cockney answers in the SED are very similar to Standard English in these respects, the map roughly represents how standard each dialect was (lexically, morphologically). So it has nothing to do with Estuary English really, although it does reveal some interesting patterns of dedialectalisation in the Midlands. No, Ed, it was because of my ignorance: I didn't know much about them (beyond the obvious), and no one had published any research into them. That's why Przedlacka's PhD work was so ground-breaking. @ Warren: Thanks for that information. I wasn't sure if "London" referred to the SED site at Hackney or to something else (probably the 1 in the "313 + 1 SED sites" at the bottom of the map). However, I argue that it is relevant to Estuary English. Isn't the idea that areas of the south-east used to have different dialects but now there is not much variation? This map shows an era before dialect-levelling in the south-east. You wouldn't get this level of difference from London now. @ John: I understand. It would've been impossible to cover everywhere evenly. Perhaps some future researcher reading this will research the rural south-east's speech. Yes, my sentence "I can't imagine that there is any trace" was probably going too far. A problem is that dialect-speakers are only likely to speak dialect with their friends and family. Shorrocks said of his work in Bolton that some people feel very nervous about speaking to strangers because they're embarrassed about how broadly they speak. I can believe this is the case for some people, but we'll never know how many. As for supposed Sussex "cockney", that is my own accent. I was born and brought up in Brighton in the 1950s to the 1980s. 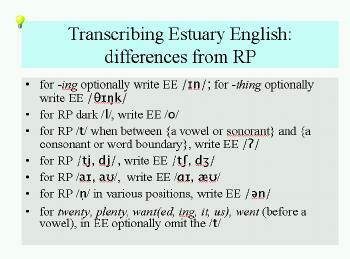 So my natural speech is so-called "estuary". We were sometimes said to be speaking "cockney" but now I live in south-east London - where distinctively London accents are alive and well it is obvious that I do not have a London accent. My vowels are mearer to RP - or possibly even Sussex - than most of my neighbours, but I glottalise /t/ even more than they do, I have less th- fronting, and am if anything even more npn-rhotic. (typical Brighton council estate). I imagine a triangle with marked RP at one corner, oldstyle cockney at another, and underlying local accents at the third. (in my case East Sissex, for most of my Lewisham and Deptford neighbours it would be Kent). Most south-east English accents are somewhere in that space. That is what "estuary" is. That's interesting. I imagine that the speech of Brighton might be mixed owing to the large number of incomers to the city. A similar thing applies to Hebden Bridge in Yorkshire. If Wikipedia is right, David Blanchlower went to school in Brighton yet his speech doesn't sound very southern to me. According to Wikipedia, the economist David Blanchflower went to the same school as me! He's older than I am and I can't remember ever meeting him though.